A brilliant combination of spicy rye malt notes and fruity hop character. Brewer’s Nightmare is an India Pale Ale lover’s dream. This is an intensely focused, if somewhat stressed, Baird brewer monitoring the Brewer’s Nightmare IPA wort as it passes from the lauter tun to the wort kettle during the critical brewing phase known as lautering. When brewing with rye malt, extremely long lauter times, and sometimes stuck mashes (the ultimate nightmare), are the norm. 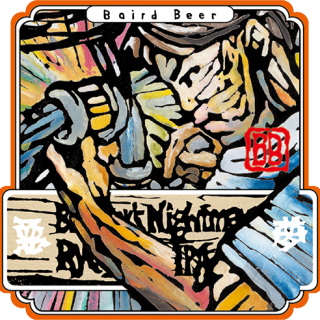 The kanji characters on the label literally mean nightmare – 悪 (bad) and 夢 (dream). We love the flavor of rye malt in beer. It lends a spicy, peppery character that we find especially pleasing when combined with large doses of piquantly bitter and pungently aromatic hops. The problem with using significant portions of rye malt in the mash (and we use 25-30% rye in the grist of Brewer’s Nightmare) is that it tends to make the wort more viscous and gummy, thus rendering lautering (separation of liquid wort from particle grain material) slow and difficult. A normal run-off time from our lauter tun would be around 90 minutes; this year’s Brewer’s Nightmare took a painstaking 178 minutes. If joyous celebration this holiday season is simply beyond your capacity, we fully understand. There is a Grinch in all of us and it needs recognition too. For the Grinch inside you, we proudly present Bakayaro! Ale.